Writing has got to be one of the most complex skills children can develop! 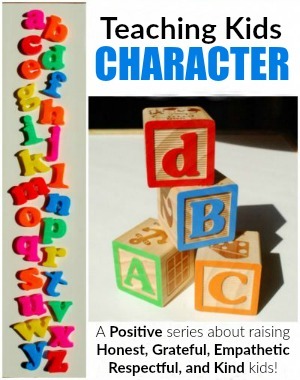 Today’s post has lots of ways you can start getting your preschooler-aged child interested in writing and developing all of the skills necessary to becoming successful with writing. There are many steps involved in a child learning to write. First, writing involves the physical fine-motor skills of holding a pencil and creating the letters. Then kids have to understand that the letters represent spoken sounds and how to combine those letters to make words that can be read aloud. This is spelling and word-building. Then they need to develop the ability to put words together into sentences that are complete and make sense. This is often referred to as sentence fluency. Lastly, the ideas of what they want to record are all important too of course! Today’s 8 tips cover all 4 of these important skills. 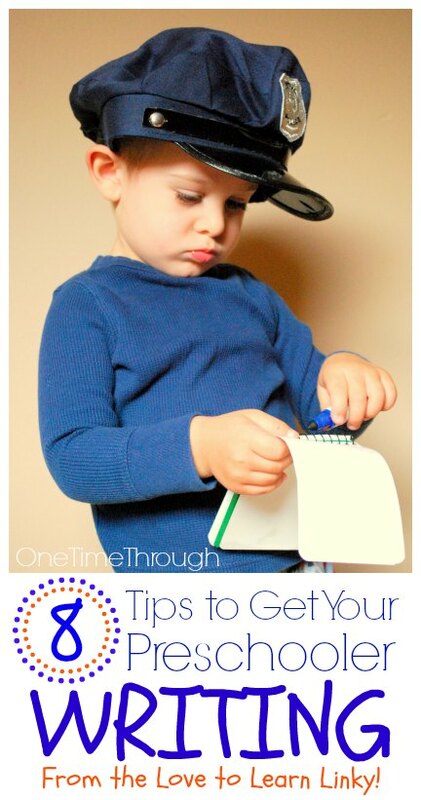 Here are 8 Ways To Get Your Preschooler Writing! 1. Provide lots of FINE-MOTOR activities for your child and show them how to HOLD a pencil/marker/crayon/chalk PROPERLY. My best tip for helping kids develop the correct way of holding a pencil (called the pincer grasp) is to give them the crayon/marker so that it’s pointing towards them. When they pick it up, and lift their hand, they should be using the pincer grasp automatically! Voila. For a fun fine-motor activity that helps develop and strengthen pincer grasp, check out our Fine-Motor Hammering Activity. Or go to Powerful Mothering for some awesome printable sheets for kids to help develop Pencil Control. Also be sure to check out our Fine-Motor Activities Pinterest board for more ideas Follow One Time Through’s board Fine Motor Activities on Pinterest. 2. Get them practising MAKING LETTERS, but keep it FUN! 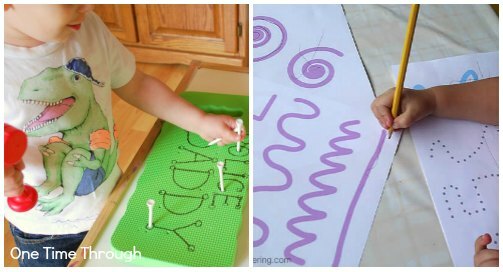 Kids can make letters out of playdough, pipecleaners, or even Lego! Think outside the box when planning activities. As well as practising on paper, have them write letters in salt, sand, or cloud dough! Check out our 10 Sensory Ideas for 10 Minutes for quick and simple ideas to set up sensory writing. I love these FREE fun printable sheets for Practising Letter Formation with a crayon or marker from Totschooling. 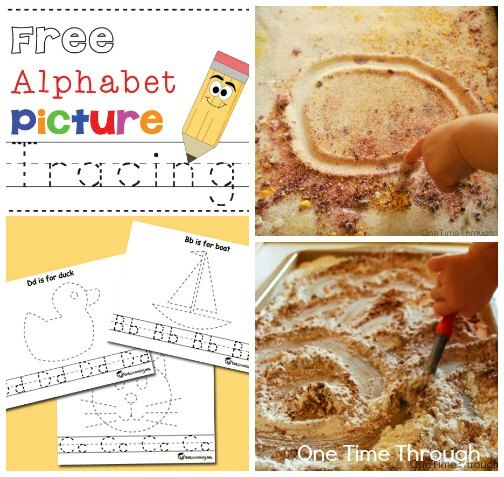 For even more ideas, check out our Alphabet Activities Pinterest board at: Follow One Time Through’s board Alphabet Activities on Pinterest. 3. 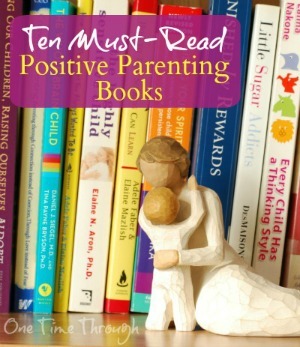 READ, read, read to your kids so they will develop a love of the written language. 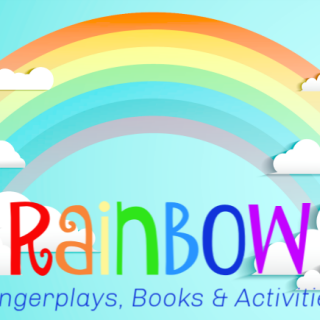 As you are reading, be sure to point to the words with your finger so your child connects the letters and words they are seeing with your voice and spoken words. They will also start to learn (without you even saying too much) that text goes from left to right, that we start reading from the top to bottom of the page, and that we turn pages from right to left, etc. My son just received a great new children’s book called The Day the Crayons Quit that is a really fun one to read (for both kids and parents!). It is told from the perspective of the crayons and each crayon writes a letter to their owner. Such a great way to get kids thinking about writing. Find even more tips for reading to kids in these posts: How to Encourage a Love of Learning and Reading Tips. 4. Play Word Building games using ALPHABET LETTER PIECES. We use letter pretzels, fridge magnets, alphabet blocks, etc. 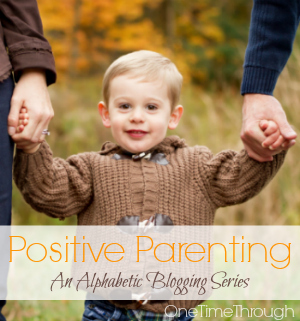 If you want to make some nifty alphabet pieces – check out these posts! 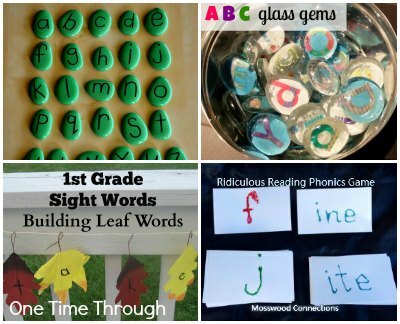 How to Make Alphabet Pebbles for word building with kids from Teacher Types. She’s an experienced teacher with tons of ideas for how to get kids using them to write! DIY Alphabet Glass Gems from Rubberboots and Elf Shoes. These letter pieces are really stunning! I want a set for me! Building Words activity using leaves from JDaniel4’s Mom. 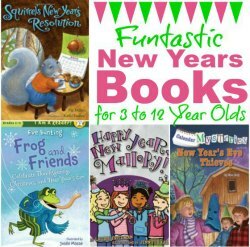 Perfect for grade 1 students! Word Building and Phonics Game from Mosswood Connections. 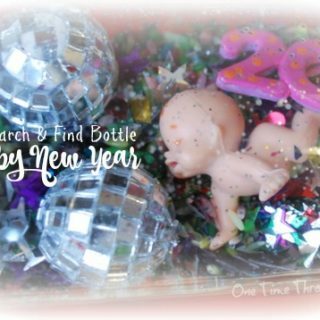 I’m going to make this fun game for my son. He loves making up nonsense words that rhyme and this game looks like so much fun! 5. MAKE books with your child by SCRIBING (writing down) what they say. This is such a great way to model writing for your child for a real reason (to make an awesome, personalized book to read! Yay!). Just get some 8″x11″ paper and fold it in half to make a basic booklet. Pick a topic and you can draw pictures yourself, have your child draw pictures, cut out pictures from magazines, or take photos for a book. Have your child tell you about each picture and have them watch you as you write down what they say below the picture! 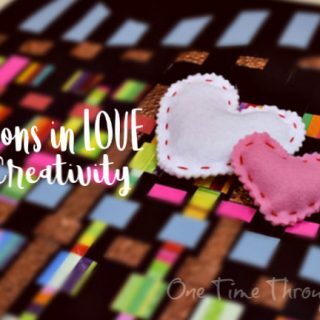 You could make a book about your child’s favourite toys, a special birthday or holiday or trip, an adventure outside, a numbers book, an alphabet book, etc. Whatever the topic, this activity helps develop your child’s sentence fluency without them having to worry about the physical aspects of writing. For some child-led book making projects, check out our Humpty Dumpty Rhyming Book, and our Spring Is… Book. You can also make a Recycled Art Journal for your child to write in from What We Do All Day. Here’s another fun activity from Mothers Madness that you can do with your kids to work on sentence fluency. Make Silly Sentences using word cards. Younger kids can do the activity if you add pictures to the words. 6. Tell your child STORIES (not reading from a book) and they will begin telling you stories too. Eventually, your child will begin to create stories for you using many of the same storytelling conventions that you can use like “Once Upon a time,” and “They all lived happily ever after!” You can record these stories on paper for them to read back later. 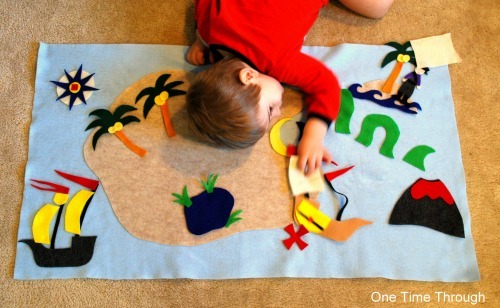 Try this Felt Pirate Storyboard for even more inspirational ideas. 7. Find REAL reasons to write. Called “authentic writing” in the education world, it’s important to get kids writing for real reasons and not just for the sake of practising writing. 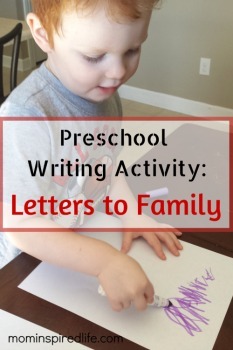 Mom Inspired Life has a great Preschool Writing Activity: Letters to Family post that will get you started. Encourage your kids to write when they’re playing (police officers write tickets, store clerks write receipts, tea party hosts send invitations). 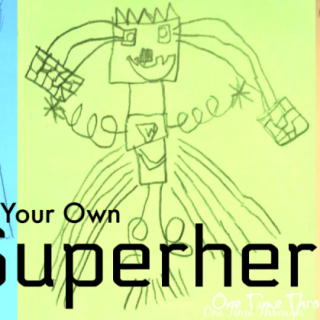 Have your child sign their name to their artwork and dictate to you what the picture is about. 8. Provide lots of different MATERIALS for kids to PRACTISE writing. Stock up on different materials to write on: paper of different kinds and colours, dry-erase boards, fun foam, chalkboards, magna-doodles, cardboard, and windows! And get a variety of materials to write with: markers, crayons, chalk, pens, Sharpie markers, pencils, glue pens, highlighters, oil pastels. The most important thing you can do though is to make these materials readily available to your child or build daily writing time into your schedule. That’s it for this week. 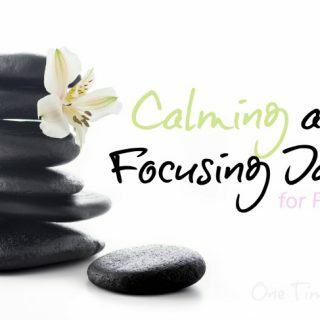 Hope you found some inspiring ideas to get you writing more with your preschooler! I’d love to hear any ideas you have for encouraging your child to write – please leave a comment below! 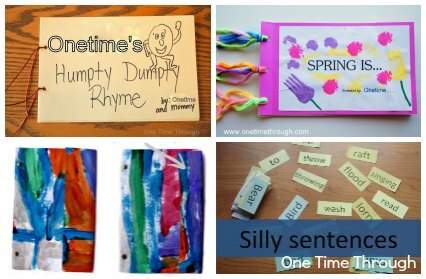 If you’re looking for even more early writing ideas for preschoolers – be sure to check out our Early Writing Pinterest board at: Follow One Time Through’s board Early Writing Activities on Pinterest. This is a fantastic resource! 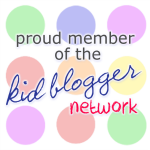 Thank you for sharing my post!